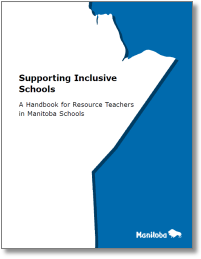 Manitoba Education and Training developed the document Supporting Inclusive Schools: A Handbook for Resource Teachers in Manitoba Schools to assist resource teachers in supporting appropriate educational programming in Manitoba schools. This support document is intended for resource teachers and other educators working in an inclusive school environment to address the diverse needs of all students from Kindergarten to Grade 12. It is not a policy document.